A 63-year-old man has also been arrested in west Belfast earlier today. 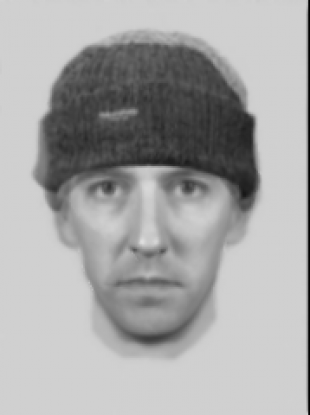 POLICE INVESTIGATING THE fatal shooting of a man outside a school in west Belfast in December have released an Evofit image of what the suspected gunman may look like. 43-year-old Jim Donegan was gunned down in front of schoolchildren and parents in west Belfast as he sat in his car waiting to pick up his 13-year-old son after school on 4 December. He was shot several times, including at least once in the head, according to the PSNI. A 63-year-old man has been arrested in west Belfast earlier today. A search of the address is also ongoing. “I have released an Evofit image of what the suspected gunman may look like in the hope that someone may have seen this person who murdered Him and put the lives of countless children at risk,” PSNI detective chief inspector Pete Montgomery said. “I am appealing to the community to help me put this extremely dangerous individual behind bars,” he said. Anyone who recognises this person or has any information that could assist with the investigation is being asked to contact 101 and ask for the detectives in Seapark investigating Jim Donegan’s murder, quoting reference number CCS 741 04/12/18. Alternatively, if someone would prefer to provide information without giving their details, they can contact UK Crimestoppers anonymously on 0800 555 111. Email “Evofit of suspected gunman who fatally shot man outside Belfast school released”. Feedback on “Evofit of suspected gunman who fatally shot man outside Belfast school released”.